Your Premier Full Service Snow Removal Service. Helmke Industries specializes in providing snow plowing and shoveling solutions in the Rockland County area including Orangeburg, Pearl River, Blauvelt, Tappan, Sparkill, The Nyacks, New City and more. Winter weather in Rockland County can be extremely unpredictable and wreak havoc on your business and personal time.Call (845) 398-2300 today for a FREE ESTIMATE and scheduled service.Our trucks are licensed bonded and insured. We service everything from small residential driveways to heavily traveled private roads to massive business parking lots. We are currently taking on new snow plow customers in Rockland County as well as northern Bergen County areas like Northvale, Norwood, Alpine, Upper Saddle River, and Montvale, NJ. Our team strives to exceed the industry standards year after year by providing the most reliable and highest quality service possible. Providing professional and timely service to ensure your roads, parking lots, sidewalks, walkways and other critical areas are accessible. Preventing costly production and delivery delays, keeping you open for business, and helping alleviate the inherent risks and hazards associated with snow and ice. You can rest assured that we will be one step ahead of all your winter weather needs. 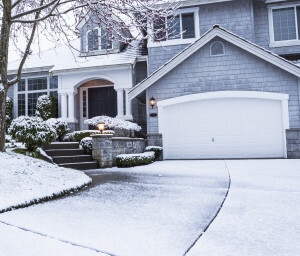 Our Snow Plowing and Removal Services will work through the storms to ensure that your home or business is clear of snow and safe both for yourself, your customers, and your employees. We have pre-treatment applications that we offer which are very beneficial in highly trafficked areas and are prone to ice build up. We apply preetreament 24 hours before the storm and so it can act as a barrier between the snow and ice. The treatment will melt snow, prevent snow and ice from adhering to the surface and once the area is plowed or shoveled there will be a significant difference opposed to untreated areas. Sand and other abrasive materials work by improving traction over ice. Friction may melt the ice, but this is an incidental addition to the functionality. If the weather is too cold, adding salt to the sand can prevent it from clumping and freezing together, becoming part of the ice and providing no traction. Cleanup of sand has become a concern because of wash away and is not permitted in some areas. Salt will melt ice as long as the temperature is not too low. Salt is the most affordable and effective way of melting ice but it can degrade ground water, concrete, lawns and soil. If the weather is too cold, the sand can clump and freeze together, becoming part of the ice and providing no traction. Adding some salt can keep this from happening. Liquid De-Icer is a method that is becoming more affordable and is a safer way to melt unwanted ice and snow. The application itself is often long lasting and keeps snow from bonding to surfaces. Overall it is safer for animals, concrete, plants, and the environment as this de-icer is applied more efficiently because it is sprayed with a hose or nozzle into tighter spaces with greater refinement of application.